The camera roll on a iOS device is meant to be a temporary container for your photos. In the old days when you went to the local pharmacy to develop film, they gave you all of your pictures in a envelope. When you got home, you organized them. You gave some to family and friends (share). You put some in frames. You put others in photo albums. When you was done, you would store the negatives and throw the envelope away. Photos imported from a Camera via the optional adapter are considered as "taken from a camera" and therefore added to the camera roll with the photos that were taken with an iPad or iPhone. When you connect your iOS device to a Mac or a PC, you are prompted to import from the camera roll into your photo area on the desktop. At the end of the import, you will be given an option to delete the imported photos - again because this is a temporary storage area. On the Mac, the app is iPhoto. On the PC, you have a separate smaller dialog window that launches along with iTunes when you plug your device into the computer. Most people automatically close this dialog window because they don't know why it pops up, this is one of the reasons; to import pictures from an external disks like an USB thumb drive, external hard drive, or iOS device. 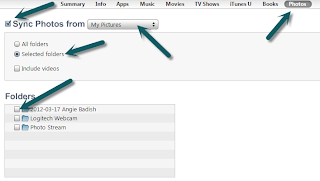 In iTunes (on Windows or Mac), when you select your iPad device name on the left; tabs will appear in the center panel (under the Apple logo). If you select the "Photos" tab, you can get to select which main folder will be sync'd like "My Pictures" or browse for a different folder. Regardless of which parent folder is selected, you have the option to select "All folders" or "Selected folders". If you select "All folders" then every picture in the "My Pictures" AND the subfolders will sync to the iOS device. If you select "Selected folders" then you are presented a list of all the subfolders inside of the parent directory. You would check the box next to each folder you want to sync to your device. The folder that are checked will sync; while the unchecked folders will not sync. On Mar 29, 2012, at 7:25 AM, Devitt wrote:> I created a new album in the Photo app and copied some pix into it. Then I went back to Camera Roll to delete the originals since I don't want them in two places. Much to my surprise, when I tried to delete, the only choice that popped up was "delete everywhere" which I definitely do not want to do. > Suggestions, anyone? That Camera Roll is getting too big to be useful.